If you follow me on Instagram, you might have noticed that I really like mugs. My family has always had a ton of mugs around, since we tend to buy them when we travel as a souvenir. The nice thing about mugs is that there are so many cute designs out there and they're also so useful! I use a mug every morning, so they really come in great use. Since I love mugs so much, I've devoted this post to the appreciation of mugs and to feature some of my favorite mugs. I got this first mug just recently for my birthday from one of my friends. This mug is from Anthropologie (they have the cutest mugs) and has a hand-drawn kind look. I love the look of this mug, right down to the blue stripes on the inside of it. You can see the strokes of the glaze in the blue stripes, which continues with the "handcrafted" look. It reminds me of when I took a pottery class and we glazed over our pieces. I know that this isn't a mug, but I think that it somewhat classifies within the category. This is a tea for one set from Cath Kidston. I picked this up while in London, making it somewhat of a novelty souvenir. It has beautiful pictures featuring London's greatest tourist attractions, such as the bright red double decker buses, the London bridge, the guards, Big Ben, Westminster Abbey, Buckingham Palace, and the London Eye. I also got this mug recently as a birthday gift from a friend. This mug was purchased from Francesca's. What is super exciting about this mug is that this mug has made it to the Francesca's instagram! They contacted me and asked me if they could feature my picture on their Instagram and it was just so exciting to see it there. However, I just love this mug because of the font type (if you didn't know, I'm absolutely font obsessed and kind of a snob when it comes to fonts) plus the gold on white! In addition, this mug was made for me, well, I guess other bloggers too. It captures my personality beautifully, which is why I adore it. I've had this mug for quite a bit of time and it's definitely a long-time favorite of mine. This mug is from Anthropologie and it's a nice big mug. It's bigger than the normal 8 ounce mug and definitely a bit heftier than the standard mug. This design is so simplistic, but it has such a classy look to it and it's perfect for sipping hot chocolate. 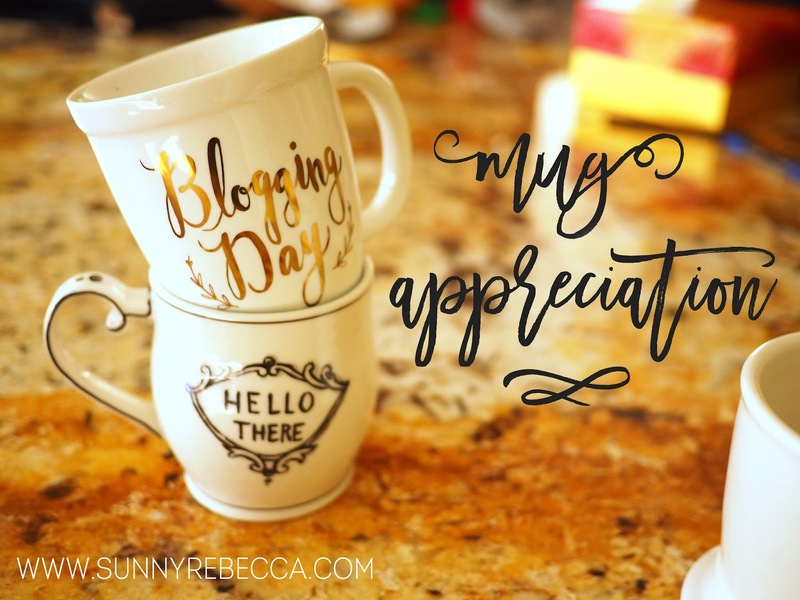 I have also linked some other mugs that I definitely appreciate so that we can share the love for mugs, if you're desperately in need of some appreciation-worthy mugs. Happy Wednesday! That restraint seems to never last for long! This is so cute! And I am in love with that teapot! OMG! This is such a unique post idea and I love it! I've been trying to grow my mug collection, and I love the Blogging Day one especially. I'm definitely a mug hoarder as well! I definitely understand your love of mugs! It seems a bit silly, but I could spend hours at Anthropologie browsing through all of them. I love the ones you featured in this post! I could too, Anthropologie has the cutest mugs!